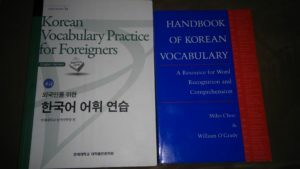 This phase of the Couch to Korean Challenge has been all about building vocabulary, and in the process I have explored and evaluated many different Korean vocabulary resources. 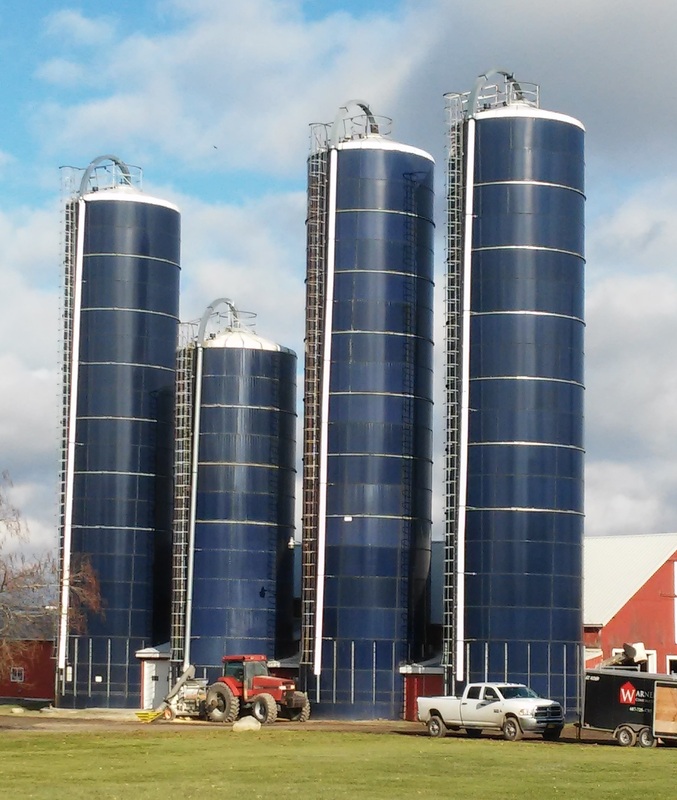 In this post I will share my thoughts on a few of these resources. 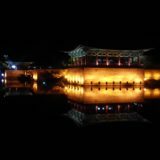 As always, I will be keeping the Korean Resources page updated with everything I come across. Finding good, organized sources of new words to learn, preferably with example sentences and audio of the words spoken by native speakers. Good sources for language learners include lists of essential grammatical function words (pronouns, conjunctions, prepositions, particles, etc. ), lists of most common/frequent words, and category lists (family words, food words, colors, etc.). Using a flashcard system with spaced repetition to learn and practice sets of new words. 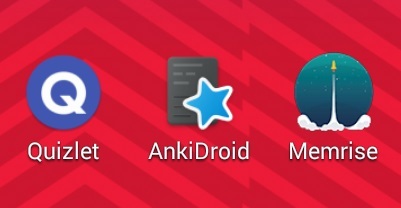 For flashcard review, I have replaced my old paper flashcards with online sites/apps, primarily Quizlet and Memrise (combined with the convenient word lists from the How to Study Korean and TOPIK Guide sites). 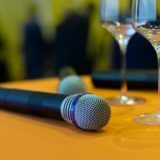 Since we have separately written Lexplorers reviews of some resources for vocabulary study using flashcard systems (for example, here and here), in this post we will focus on resources for finding and learning new words. 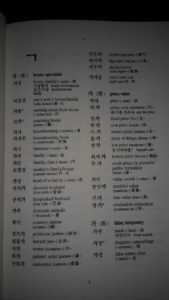 The Handbook of Korean Vocabulary: A Resource for Word Recognition and Comprehension is a nice resource for learning a set of semantically-related Korean words of Chinese origin. The book is organized according to the Chinese Hanja character that originally was used to write the related Korean words. For example, the Hanja character 家 with the Korean pronunciation 가 / ka is used in a set of words related to “home” or “family”. Korean words containing this Hanja character include 가족 / kachok (“family”), 가정/ kacheong (“household, family”), 가구 / kagu (“furniture”), and 국가 / kukka (“country, homeland”). In contrast, the Hanja character 價 also has the Korean pronunciation 가 / ka but is used in a set of words related to “price” or “value”. 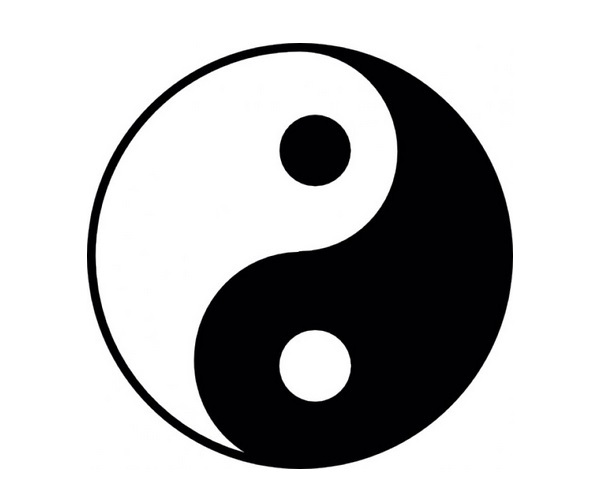 Korean words containing this Hanja character include 가격/ kakyeok (“price”), 가치 / kachi (“value”), and 대가 / teka (“cost”). 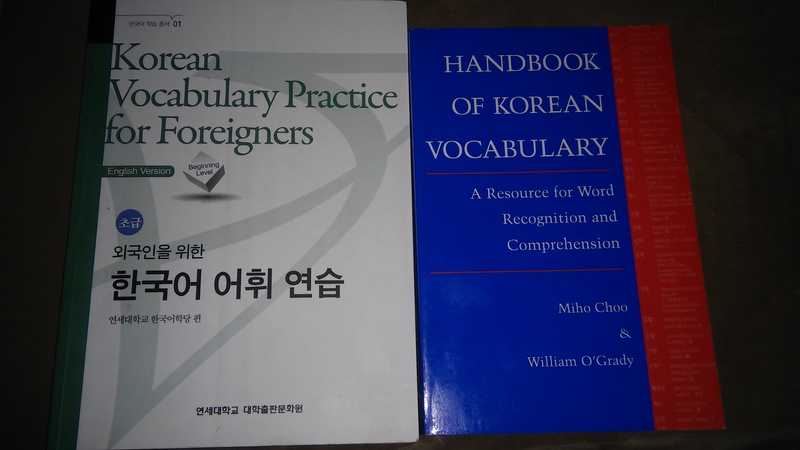 The Handbook of Korean Vocabulary is an ideal resource for someone who can already read the Hanja characters, such as a speaker/reader of Mandarin or another language that uses traditional Chinese writing. 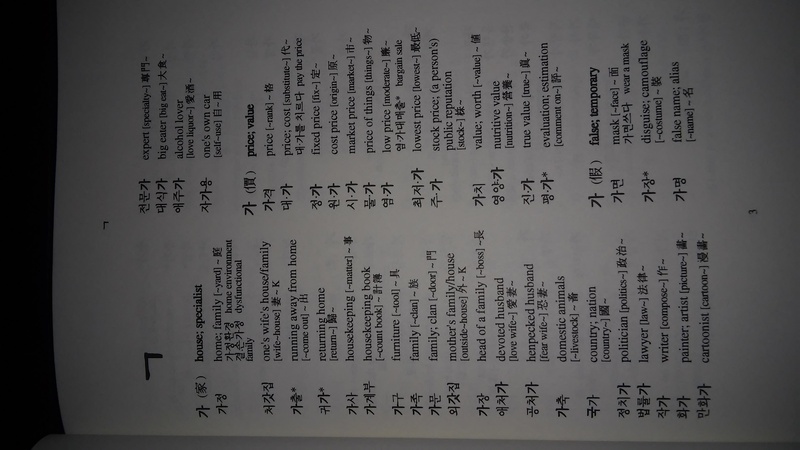 However, even with no background in reading Hanja characters, I am finding the Handbook to be a very useful resource for learning sets of related Korean words and their common semantic syllables. 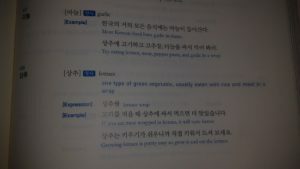 Another resource I am finding very useful is Korean Vocabulary Practice for Foreigners. It contains hundreds of entries organized into categories such as Time, People, Food, and Residence. Each entry contains pronunciation, part of speech, English definition, and example sentences in both Korean and English. Having examples of new words in actual sentences is perfect for a language learner. A large collection of bilingual sentence examples is also ideal for learning (or solidifying) grammar concepts. 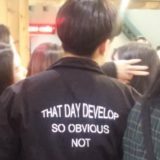 The English translations of the Korean sentences are mostly good, but they are clearly written by a non-native English speaker and contain minor grammatical errors and awkward phrasing. 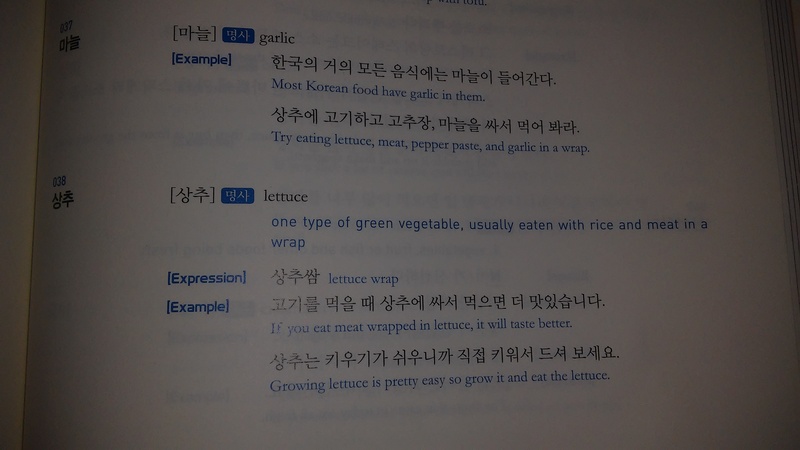 For example, in the entry for garlic, the example sentence is “Most Korean food have garlic in them.” One sentence for lettuce is “Growing lettuce is pretty easy so grow it and eat the lettuce.” But I am not trying to learn English from these sentences, so I can easily overlook the errors as long as the Korean sentences are correct. I recently revisited the Oxford Picture Dictionary English-Korean, which I first looked at in the early stages of the Couch to Korean Challenge. This is an interesting thematic dictionary made for learners of (American) English, with pages of pictures for topics like family members, body parts, and fruit. 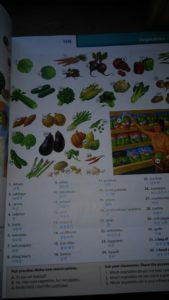 The book is available in a wide variety of languages; the English version and pictures are identical in each version, with the non-English words changed to the appropriate language. I am finding the Oxford Picture Dictionary especially useful for targeted learning of new categories, such as vegetables and mammals and clothing. Since the book is made for American English learners, there is a bias toward American topics such as U.S. History and U.S. National Parks. 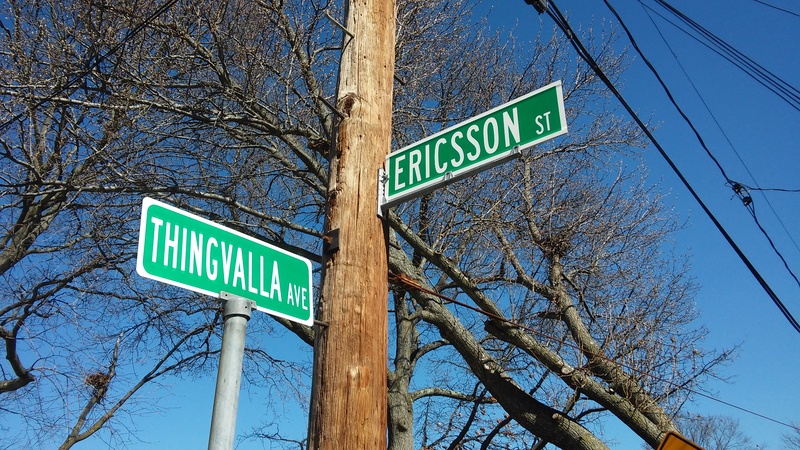 The book also does not address the specifics of the non-English language, assuming that all readers are learning English and not the other language. For example, on the Numbers page, only one of the two Korean number systems is given, and the Colors page doesn’t address the many different forms that Korean color words can take. 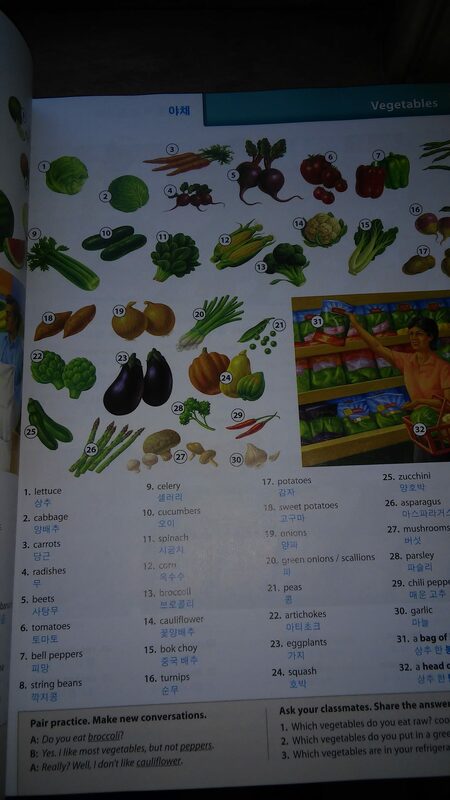 But the book is well organized, and the pictures are very helpful for visualizing the items represented by new words. 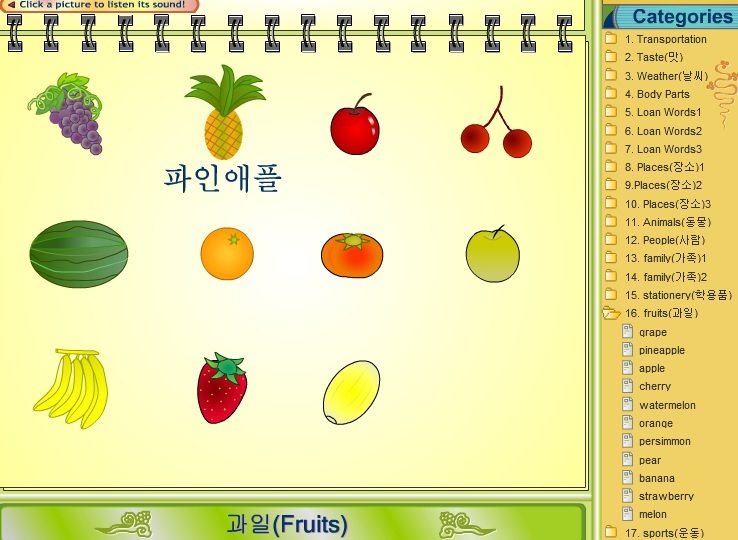 The University of Indiana Online Korean Multimedia Dictionary is similar to the Oxford Picture Dictionary in that it organizes the vocabulary into categories like weather, colors, fruits, and family. 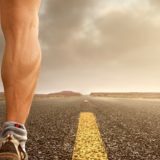 This online dictionary also has pictures for the words and has the added advantage of having audio recordings (one male voice and one female voice) for each word. The pictures for a topic first are shown without the written word, which only appears when you mouse over the picture. This makes it easy to practice word recall by first looking at the picture, then clicking on it to see the word and hear it spoken. 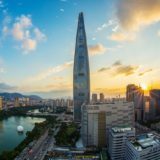 Just for fun, I flipped through Your First 100 Words in Korean. I am generally skeptical of these kinds of “It’s Fun! It’s Easy! Learn a language in just 10 minutes a day!” language learning resources. 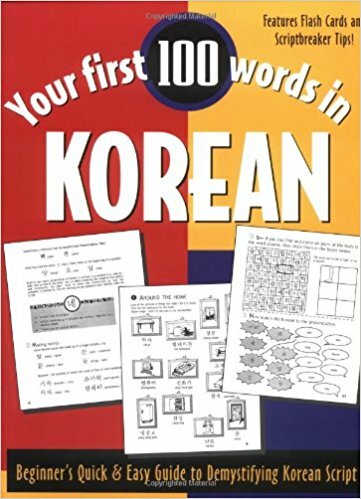 Your First 100 Words is full of cartoons and matching exercises, and it primarily is targeted at helping a beginner with “Demystifying Korean Script” (although this is made more difficult by the incorrect and inconsistent pronunciation guide). While I would never use a book like Your First 100 Words as a serious resource to learn a language, it can serve a useful purpose in the early stages of vocabulary acquisition (and it is great for kids). The book is limited to basic vocabulary (i.e. the “First 100 Words”), and the matching exercises and tear-out flashcards are useful for practicing these 100 words. I don’t consider words like “refrigerator” and “monkey” to be among the first 100 words I want to learn in a new language, but this book is a fun alternative to the denser resources I have been spending most of my time with.